Use the converter by Movavi! Today we have so many home and mobile devices on which we can play back music: computers and music players, smartphones and tablets, even coffee machines and fridges! It sounds very convenient, at least at first: you can listen your favorite songs almost everywhere you want: relaxing on the sofa, cooking in your kitchen, on your morning jog, even travelling by train or plane. But then there’s the problem of format incompatibility. Every device has its own list of supported audio formats, and very often formats that you can easily play on one device can’t be opened on another. Don’t be a hostage to your device’s picky requirements! With a powerful converter for music files, you can easily transform your songs and podcasts so you can play them on to the device of your choice. Download the Windows or Mac version of Movavi Video Converter and check out this short tutorial on how to convert music files to other formats. Download and open the installation file on your computer. Follow the on-screen guide to install the converter of music files. 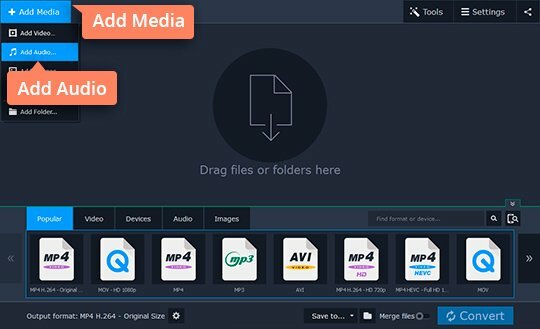 Click Add Media, then Add Audio and browse the audio files you need to convert. 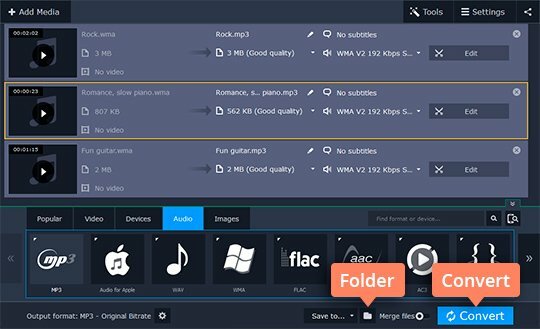 There are almost no restrictions on input file formats – the Movavi music and video converter supports more than 180 media formats, including MP4, MP3, WMA, FLAC, and other popular formats. Move to the Audio section and find the format you need. 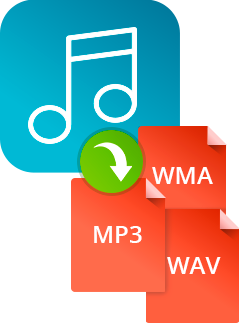 All the items on the list are expandable – just click on them and for some options like MP3 or WMA, you’ll see lists of additional presets. Want to convert your files for a mobile device? Go to the Devices section, find and click the brand name of the device, and select the most appropriate option. Need to fine-tune the settings for a selected preset? Click the Settings button and you’ll be taken to a window where you can set all the desired parameters. Now, click the Folder icon and change the location if you want to use a different folder. You are ready to convert – just click the Convert button, and the file transformation will be complete in just a couple of minutes! 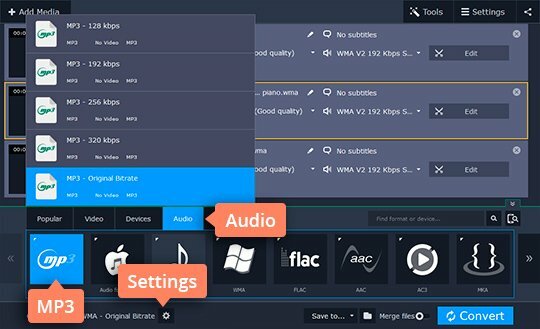 After the program has finished the conversion, the folder with the converted audio tracks will open automatically on your computer, so you can immediately start listening to them or download them onto another device. The ideal way to get your media in the format you need! A comprehensive, streamlined video editing program that has everything you need to create amazing home movies with custom soundtracks, special effects, cool titles, and transitions.